Learn How to ‘Morph’ a Morph! Aardman have teamed up with Crayola and ODEON Cinemas for a fantastic competition. To enter, you’ll need to make your own hand-drawn animated movie. Here are some tips to help you. It’s time for another Animate It! animation tip from Aardman’s top model maker, Steve Edge! In this tutorial, learn how to fit 20 people into a box and still be able to lift it! Learn How to Make Morph Swim Through a Table! Learn how to make a Morph model swim through a solid object using some simple animation techniques! Just bought the Animate It software for your computer? In this tutorial let Steve, a top Aardman animator, will show you how to get set up as well as teaching you some top animation tips! An important part of animation is exaggerating the movement of your static objects to make them come alive! In this tutorial, Ricky will teach you the technique of “squash and stretch” to animate a bouncy ball using a pen and some paper. If you’re new to animation it can be difficult to know where to start. In this video Merlin (the creative director of Wallace & Gromit!) will show you a few handy hints on how to get the ball rolling. How To Use Animate It! The Animate It! software is really simple to use. In this video, Steve, one of Aardman’s animators, shows how easy it is to create your own animation using Animate It! 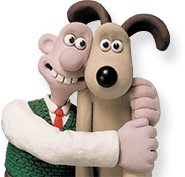 If you’re looking for animation tips, then who better to ask than the creator of Wallace & Gromit, Nick Park? In this video he’ll give you his top 10 tips for creating a cracking animation of your own!